This report for the November UPDATED ‘FACTS’ from the Washoe County Assessor Records since last posted for October, 2017, in An ArrowCreek Property Value Update (October 2017 from Washoe County Assessor Records), shows that we continue the Fall buying/selling season with an additional six properties changing owners during this reporting period. Custom Homes on the Golf Course show a 15.7% premium to customs not on the course. 1. ArrowCreek properties have stayed in the premium class within Washoe and Douglas Counties. As you read this report you will see that prices have improved for properties on the golf course, with an average appreciation rate of 13.0% over this past year, while prices for homes not on the golf course have flattened back to an increase of 1.0% over the same period. With six properties changing hands this past month, the ‘hottest’ neighborhood was Winding Ridge. a.) Six (6) properties were recorded sold in ArrowCreek between 7 October and 9 November 2017 (per the Washoe County Assessor, who appears to be running late as the data was extracted on 24 November and the last ‘sale’ recorded was 9 November). This brings the total number of properties transferred over the past rolling year to 82 or 7.6% turn-over rate for our community. This is a relatively low rate, still in the single digits, that may be attributed to a general satisfaction with living in our gated community or a positive perspective on our amenities and an emphasis on the secure stable environment offered within ArrowCreek. b.) One (1) property on the golf course (where the property boundaries actually touch the golf course, not just have a ‘view’ of it) was closed during this reporting period. The rolling average selling price for homes on the golf course now stands at $286.36 per square foot. This is an increase of $0.07 per square foot from October’s value, based solely upon the statistical rolling average calculation. The 12-month rolling average sales price increased to $1,109,285.92, again based upon statistical methods. No additional lots, on the course, were sold. The rolling average selling price for undeveloped property on the golf course still stands at $234,568.06 per acre. c.) Five (5) properties were sold that are not connected to the golf course. The rolling average selling price for off course homes decreased to $245.14 per square foot, which is down by $1.95 per square foot. The twelve-month rolling average sales price decreased to $802,138.71. One (1) additional lot was sold during this reporting period. The rolling 12-month average selling price for vacant land, not on the golf course, now stands higher at $268,425.17 per acre. 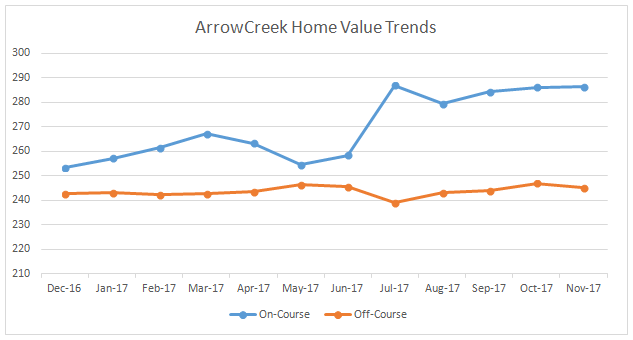 Please Note: The real estate data presented to the Friends Of ArrowCreek (FOA) at a gathering at the Club at ArrowCreek by RE-MAX associates showed the same increase in values for ArrowCreek as the data presented above. The biggest ‘threat’ to the three above communities’ home values comes from the ‘new’ tax bill working its way through Congress. The “Limitation on Mortgage Interest” as a deduction, for homes sold above $500,000, could have potential buyers shying away from our community. Couple that with property taxes potentially being disallowed, and you’ve got a real threat.